THE DUBLIN PORT Company has announced that it is proposing to transfer a “significant” portion of Bull Island to Dublin City Council. It said today that it will also partner with Dublin City Council and Fáilte Ireland in a feasibility study for a new interpretative centre and international visitor experience at the Bull Island biosphere. The company said it will contribute towards the development of a master plan for Bull Island following the conclusion of the study. The land measures 10.5 hectares and is close to the port and adjacent to the Royal Dublin Golf Club, to the western side of the island beside the North Bull Wall. Currently, this land is used for recreational purposes, including access to Dollymount Strand. The port company will also allocate up to €1.2 million towards the cost of the study, master plan and new services or facilities identified for Bull Island. Members of the public are being asked to give their say on the plans for the area. The company said that the proposal “will provide a legacy that enriches Bull Island as a precious natural resource”. The proposal will be included as a ‘community gain element’ to Dublin Port Company’s planning application for new and deeper berths in the Alexandra Basin and on the river towards the east of Dublin Port. This is the first significant project for development under the company’s master plan, which provides the framework for the future development of Dublin Port to 2040. It was announced in February 2012 that under the master plan, Dublin Port Company will invest €110 million over the next five years as part of the plan, with a total of 600 million to be spent on the port between now and 2040. Minister for Transport, Tourism and Sport, Leo Varadkar commended Dublin Port for the initiative and for its ongoing contribution to the city. Eamonn O’Reilly, Chief Executive of Dublin Port Company, said that its major master plan project will deliver more than three kilometres of new deeper berths for passenger, freight and cruise ships. Owen P Keegan, Dublin City Managerat Dublin City Council, said that a feasibility study is being carried out to consider the potential for redeveloping the visitor centre on the island as a flagship project for natural heritage interpretation. “This project and the on-going conservation of wildlife on the island will be much strengthened by this new partnership with Dublin Port Company,” he added. People are being asked to share their views on the proposal for Bull Island by Friday, 18 October 2013. You can find out more about submissions at www.dublinportabr.ie, and interested parties are invited to make their submissions to abr@dublinport.ie or to Charlie Murphy, Dublin Port Company, Alexandra Road, Dublin 1. Email “Port company proposes giving Bull Island land to council ”. 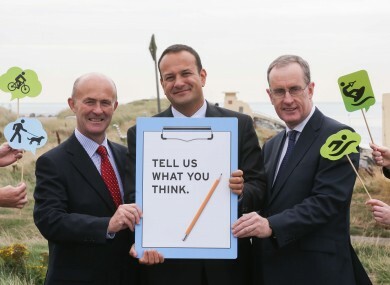 Feedback on “Port company proposes giving Bull Island land to council ”.